Managing Commercial Construction has never been more difficult. The projects are more complex, there are a lot more players contractually involved in each project (trade contractors instead of old school GC’s), and the industry is as litigious as it has ever been! Meanwhile, scheduling technology hasn’t evolved to keep pace with all this complexity. This disconnect contributes heavily to creating the key problems facing construction project stakeholders: Overruns and delays. An alarming 75% of commercial construction projects are delayed and/or over budget. One major reason for this problem is mismanagement of construction schedules, but those schedules also hold the key to a solution. You are unwittingly collecting loads of valuable data through your scheduling tools, such as Primavera P6 or MS Project. Now all you need is a simple way to make sense of it all –to understand where your projects went wrong and how to avoid those mistakes in the future. In general, the industry not understand how to build a strong construction schedule that is worthy of managing a job. I learned this the hard way. My firm has launched a software offering that helps analyze schedules and through our experiences with clients we found that most schedules are constructed so poorly that they can’t be relied upon for analysis. In fact, schedule quality was so poor that we had to build out an entire schedule correction system just to be able to accurately analyze the data. Why does this situation exist? Not enough people know how to schedule well, and the ones that do are too busy to even double check their work. And scheduling experts/consultants, which I formerly was, are very expensive. Not to mention, terms like “proactive” and “data analytics” seem to be treated like kryptonite to people in Construction – which segues nicely into my next reason. When updating schedules, the focus tends to be on logic and durations rather than studying actual performance data. 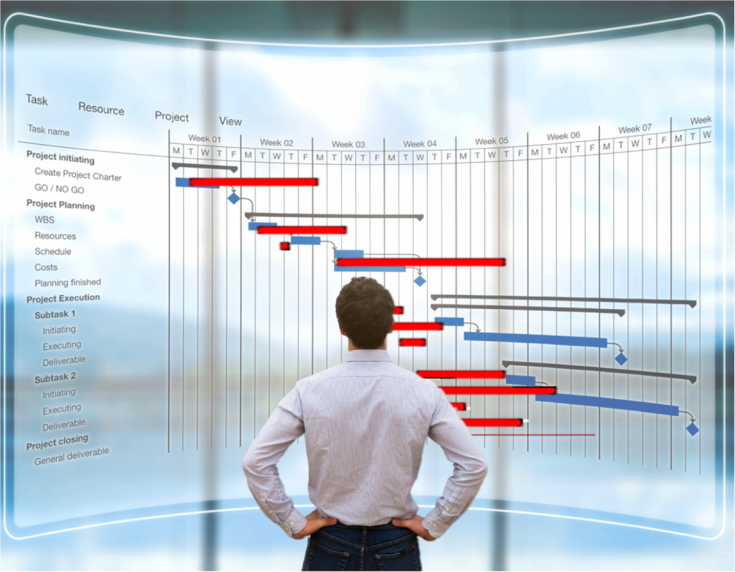 Project schedulers rarely have the time to study performance data, challenge durations, question the sequencing, review performance history, meet with subs, and then, adjust the schedule to be realistic and achievable – regardless of how aggressive the PM’s wish it would be. Unfortunately, most of their time is spent trying to get the end date back in as quickly and last minute as possible…every month. As an example, I collaborate with a very good scheduler (one of the best I have seen), who works for a very reputable contractor here in the South, and he is currently managing twelve large commercial projects at one time, each with 1000+ activities. This gives him a day or two at best to update each one, and he is pull planning too! He has no time to talk to anyone, study performance history, or even double check his logic. You just can’t do a topnotch job under these conditions. Studying data contained in schedules is tedious work. What most people don’t know, that I learned from experience, is that the more you study the intricate details of the data contained in the schedule, the more you know about the job, and the better you can manage projects to successful completion I have personally studied a single schedule for weeks at a time. I would review historical durations, study logical flows, and identify critical path delays and missing logic. This in-depth analysis allowed me to extrapolate likely future scenarios, and critical paths, repairing any schedule deficiencies, and updating the go-forward plan with confidence that it could be achieved – and an owner could confidently rely upon it to run their business. What I learned was that once I had done all that, I knew more about the project plan and schedule than even the people who were out there walking the site every day. This is useful insight when trying to manage effectively. Overconfidence bias is at the root of the schedule management and updating Problem. Planning fallacy is a major problem in project management in all industries. People, like you and me, are wired to believe that we can accomplish more in less time than is humanly possible. In Construction, with all these large and complicated schedules, this planning fallacy issue is compounded. And it gets worse every time a schedule is updated. Think about it – if activity durations are on average shorter than what’s realistic, then sequences of activities will have a compounding effect of misrepresentation. This is further compounded at each update when logic has been removed and durations are shortened to combat inevitable delay. Ironically, the overconfidence bias results in an unreliable schedule that no longer inspires confidence at all. An unreliable schedule and inaccurate critical path are misleading to stakeholders, detrimental to productivity, and still result in delays. A triple whammy that usually ends in a dispute! Fear of legal disputes is a real problem. If a project is inevitably going to be delayed, then it is inevitably going to be over budget. Delays don’t come without a cost – whether it be added project costs, extended GC’s or lost revenue as a result. Understanding the schedule is the only reliable way to capture what really happened – and most schedules are poorly constructed and compressed beyond recognition. The end result is a lot of finger pointing, litigation, and large fees to consultants and lawyers! The good news is that there is a solution. My team of experts at SmartPM has spent years working tirelessly to build a technology solution that drastically improves the schedule mismanagement problem in construction. It addresses all of the issues above and is designed for both owners and project controls teams at large Construction Management firms. It is not a planning tool, it is not a project management system. It is a first-of-its-kind full service schedule analytics system designed specifically for stakeholders in the construction industry. It very simply imports the P6 and MS Projects schedule files provided by construction teams and tells anyone who wants to know what they need to know to effectively manage the project schedule. It analyzes schedule quality, integrity, critical path delay, compression, feasibility and even forecasts realistic completion dates. It far surpasses the capabilities of any other system and was designed by a team of consultants who have studied and analyzed schedules ad nauseum on behalf of capital project stakeholders for some of the most reputable consulting firms in the world. The bottom line is that it forces accountability across all stakeholders, which is necessary in this business in order to succeed on our projects. Obviously, I truly believe in our technology and have seen it work for some of the most complex construction projects out there. I would not put my name on anything that I didn’t 100% believe in, which is why I am willing to put my money where my mouth is and offer a Free Schedule and Delay Analysis to demonstrate the power of the solution.